Epstein-Barr virus (EBV), Cytomegalovirus (CMV) and Human Herpesvirus 8 (HHV-8) occur as silent lifetime infections in the vast majority of people. But when there is immunosuppression they reactivate to cause disease. EBV replicates in B cells and is linked to several forms of malignant lymphoproliferative disease, with EBV-associated Burkitt’s lymphoma accounting for the majority of childhood malignancies in equatorial Africa. 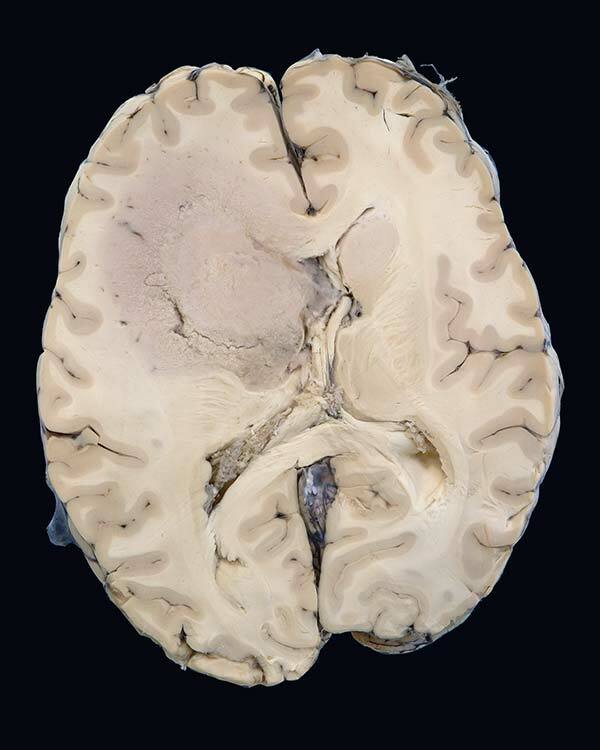 Clinical data: The patient was a 27 year old woman presenting with first time seizures. She was known to be HIV positive with a CD4 count of 301/ul. She had undergone six months treatment for tuberculosis in the preceding year. CT brain showed a space occupying lesion thought to be compatible with a diagnosis of tuberculosis (TB) or toxoplasmosis. 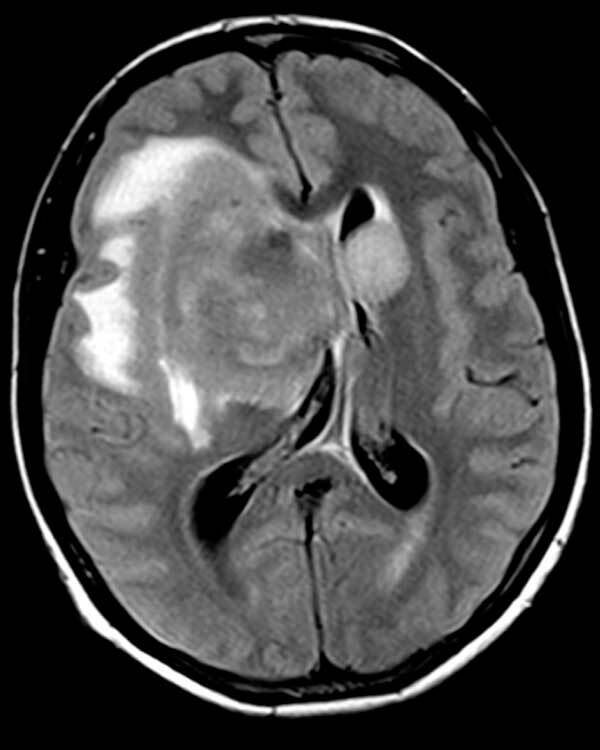 MRI scan showed a necrotic mass, indicating either an infective or a neoplastic lesion. She was treated with steroids and anti-tuberculous drugs but died 10 days after admission. Microscopically: Microscopy showed malignant lymphoid cells, and the tumour was characterised as a large B cell non-Hodgkin's lymphoma. Comment: Primary CNS lymphoma is an important malignancy in HIV infected patients, and > 90% of these lymphomas are EBV positive. EBV infection and most of the mutations that precede malignant transformation occur before the B-lymphocyte invades the CNS.